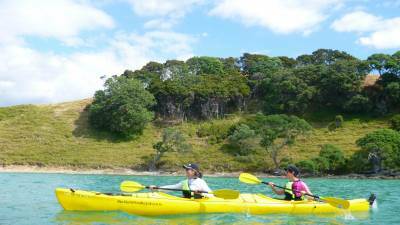 Auckland Sea Kayaks offers you the chance to sea kayak the 'Auckland Kayak Trail' self guided at your own pace in your own time. 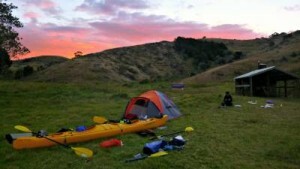 Te Ara Moana – the seagoing pathway, takes kayakers from Omana Regional Park near Maraetai to Waharau Regional Park in the foothills of the Hunua Ranges near Kaiaua with camping options at purpose-built campgrounds along the way. Te Ara Moana is one of many routes traditionally paddled by Mãori to travel between settlements, carry goods for trade and gathering food. To this day the Iwi of Tamaki Makaurau maintain strong ties with the Hauraki Gulf, Tikapa Moana (Firth of Thames) and Te Ara Moana. This is one of New Zealands most stunning coast lines with long white beachs, newly adapted camp sites for kayaks in an area that offers you a feeling of escape in a controlled environment. Auckland Sea Kayaks are Auckland's sea kayaking specialist. You'll appreciate our safe, modern, single and double rental kayaks! We can provide you with all the equipment, advice and back-up you need to get out there and experience the beauty of this area at your own pace, in your own way. Top grade accessories include life jackets, spray decks, paddles, pumps, waterproof maps, spare paddle, sponge, emergency flares and rope. We also issue the latest marine weather forecasts and tide tables to each group. Prior to departure you will attend a comprehensive safety briefing covering all aspects of kayaking from correct use of equipment through to emergency management and weather assessment. Click HERE to see a video with more information and HERE for detailed brochure and map. Delivery charge of kayaks may apply to small groups or free pick up in Eden Terrace, Auckland Central. This rental is subject to minimum numbers.